It’s another Moleskine Monday. 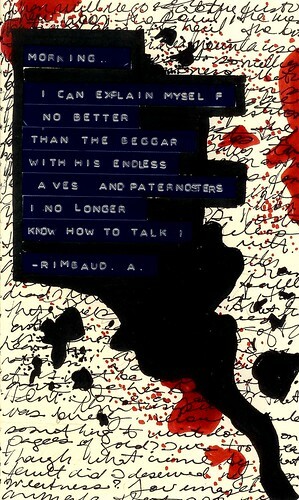 Monday morning with Arthur Rimbaud. A mini-season in Hell? Have a good one. Morning, was originally uploaded to flickr by Reavel, a Puerto Rican artist with a thing for poetry. She has a blog called The Blog. I really enjoy seeing what everybody’s doing. Thanks for this space on your blog. Makes me really happy that others enjoy poetry and also the lovely always useful moleskine. Will be added to my art love link on my blog roll.